This depends on what information arrives with the presented call. Most of the time all you will get is the caller's telephone number. The telephone number would show country, and you maybe do some lookups to find out more as to who this telephone number belongs to. 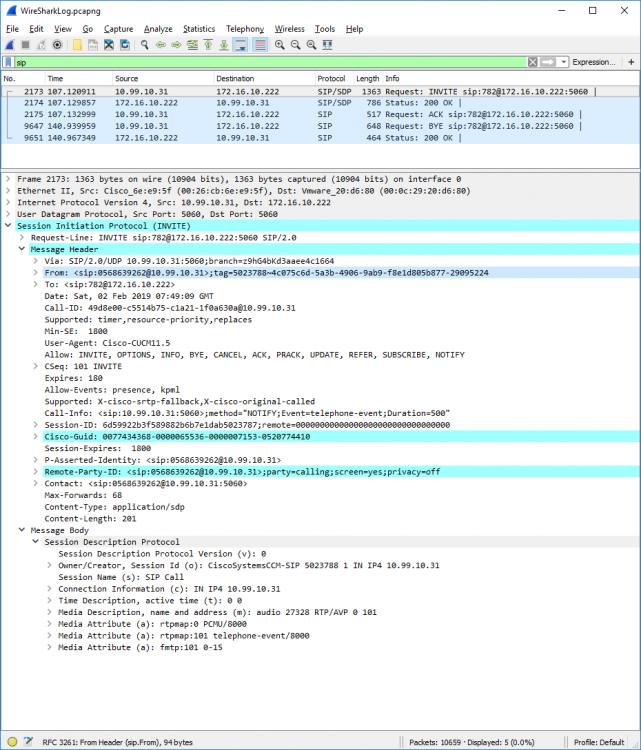 Can you post a WireShark trace capturing the incoming call? We can then see what information is provided with the incoming call. Please find the attach Wire Shark Log for Incoming call. Trace shows the only information that is sent on this call is the telephone number. Looks like you have a Cisco CUCM that has external trunks over which this call arrives into the CUCM, and then the call is sent by the Call Manager to VoiceGuide. Most likely the CallerID number was the only information that was supplied on the call coming into the CUCM. You could check with your trunk provider over which the incoming calls arrive to see if they can send any other information with the call, but then the CUCM would need to be able to forward that information on. If trunk provider is sending other information but the CUCM is blocking it then you may want to look into connecting an external trunk from that trunk provider directly to VoiceGuide.